The Columbus, Ohio employment attorneys at Nardone Limited regularly assist our clients with labor and employment issues, such as Department of Labor compliance, as well as advice on preventing and responding to discrimination charging affidavits filed with the Equal Employment Opportunity Commission (“EEOC”) and the Ohio Civil Rights Commission (“OCRC”). As a part of Nardone Limited’s employment law practice, we are always following recent employment law news and events. In addition to following updates regarding the law, from time to time Nardone Limited’s employment attorneys aim to identify areas of common legal misconceptions and clarify the applicable law for our blog readers. For example, we previously blogged about the common myths surrounding non-compete law. Similarly, another relevant employment law topic that has been the subject of very widespread misconception is the scope of the National Labor Relations Act, and whether it applies to non-union employers. The widespread misconception is that the protections under the National Labor Relations Act (the “Labor Relations Act”) only apply to labor unions and employees that are members of labor unions. But, that is not the case. In fact, although there are some provisions that only apply to labor unions, the broader protections under the Labor Relations Act apply to many private employers, regardless of whether their workforce is unionized. 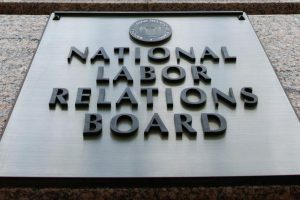 The question of whether the Labor Relations Act applies to an employer is not decided by whether its employees are unionized. Rather, there are jurisdictional thresholds regarding the business operations of various types of employers, which govern whether the Labor Relations Act applies. As stated above, applicability of the Labor Relations Act depends upon whether an employer’s business operations meet certain thresholds. The National Labor Relations Board (the “Board”) sets forth distinct thresholds for various types of businesses. The Board has statutory jurisdiction over private sector employers whose activity in interstate commerce exceeds a minimal level. Upon application of the statutory jurisdictional levels, the Board’s jurisdiction is actually very broad and covers the great majority of non-government employers with a workplace in the United States, including non-profits, employee-owned businesses, labor organizations, non-union businesses, and businesses in states with “Right to Work” laws. Employers in retail businesses fall under the Board’s jurisdiction if they have a gross annual volume of business of $500,000 or more. This includes employers in the amusement industry, apartment houses and condominiums, cemeteries, casinos, home construction, hotels and motels, restaurants and private clubs, and taxi services. Shopping centers and office buildings have a lower threshold of $100,000 per year. For non-retailers, jurisdiction is based on the amount of goods sold or services provided by the employer out of state (“outflow”) or purchased by the employer from out of state (“inflow”). Outflow or inflow can be direct or ‘indirect,’ passing through a third company such as a supplier. The Board takes jurisdiction when annual inflow or outflow is at least $50,000. Channels of interstate commerce: For businesses providing essential links in the transportation of goods or passengers, including trucking and shipping companies, private bus companies, warehouses and packing houses, the minimum is $50,000 in gross annual volume. Religious organizations: The Board will not assert jurisdiction over employees of a religious organization who are involved in effectuating the religious purpose of the organization, such as teachers in church-operated schools. The Board has asserted jurisdiction over employees who work in the operations of a religious organization that did not have a religious character, such as a health care institution. Indian tribes: The Board asserts jurisdiction over the commercial enterprises owned and operated by Indian tribes, even if they are located on a tribal reservation. But the Board does not assert jurisdiction over tribal enterprises that carry out traditional tribal or governmental functions. Federal, state and local governments, including public schools, libraries, and parks, Federal Reserve banks, and wholly-owned government corporations. Contrary to popular belief, the Board’s jurisdiction is quite broad and applies to many employers that do not have union workforces. Thus, employers should take the time to learn whether they are subject to the jurisdiction of the Board based on the thresholds set forth above. And, employers should talk with their labor and employment attorneys about what policies and procedures need to be implemented to avoid violating the numerous employee protections under the Labor Relations Act.